What are amongst the easiest native plants to grow from seed? This is a trick question because if you put a seed in a condition it loves, it’s easy! But clearly almost any annual is easy since they are primed to sprout and grow quickly once the rains come. They can be planted in place and not bothered with again until you are ready to take them out. I should also note that there are typically very few annual native plants in pots at nurseries - seeds are the best way to get variety. On the perennial front, in San Diego I planted an Encelia californica (Bush Sunflower) from seed and was amazed that it grew to 3 feet and bloomed in the first year. Can you tell us about some of the interesting plants that you have germinated from seed? My prize was a Lilium pardalinum (Tiger Lily) that I started from seed. Growing bulbaceous plants from seed requires commitment. To see that beautiful flower 3 years after planting the seed was a joy. We have several varieties of seeds for bulbing plants if you would like to try it. I also think that I finally have established our native milkweeds from seed (Asclepias eriocarpa and Asclepias fascicularis) and thoroughly enjoy watching the lifecycle of the monarch unfold in my garden. What are the biggest challenges in processing the seeds for selling? Sourcing bulbs: Many of the old school bulb farmers have closed up shop-I couldn’t find any calochortus bulbs this year. Cleaning seeds: The group doesn't have a real seed cleaning machine or very good tools so we hand-clean everything that doesn’t come in clean. Preparing labels: No label company makes a precut label that fits our envelopes so we have to hand score and cut each one plus we have to make up new ones when we acquire a new species. Inventory control: With over 100 species in various states of unclean, clean, packaged and labeled, I could spend hours each week documenting everything. Distribution: The seeds are all at my house and I don’t get to all of the events where folks would want seeds. Oh wait! That’s almost everything but I’ll just throw out that I would love some help in any of these areas and thoroughly appreciate all of the help from our volunteers in these and all tasks! Is there a piece of advice you would offer to those who might want to try germinating California native seeds for the first time? I always tell people to plant some seeds where you want to see them grow and some in sterile pots so that you can identify them when they come up. Keep both damp until you see the seedlings emerge - and, remember, it can be weeks for some plants. Starting them in pots has the added advantage of giving you a backup supply to plant out and to identify weeds by process of elimination. I advise that you hand pull all weeds before they get too big. Also do not underestimate the destructive power of snails slugs and birds in pots or the ground. I’ve had whole flats mowed down overnight. If I hadn’t noticed small seedlings the night before I would have thought the seeds never germinated. Bait for snails and cover seedlings with netting if you can. What is being offered for the first time this year? 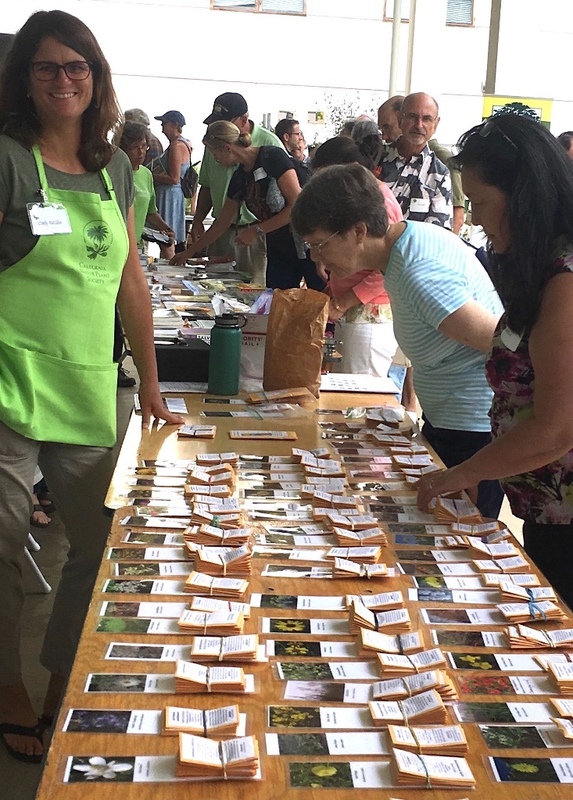 We have an amazing group of volunteers who collect seed from their own gardens or private property and donate them to sell to our members. In this way we have some plants that are almost never available at nurseries. You can see our current list of seeds on both Google Docs and as a Calscape list. Packs from commercial sources or gardens are about $2, wild collected seed usually $4 and rarer varieties go up to $5. If there is a specific watershed you would like your seed to hail from, let me know and I can tell you what wild collected seed we have from your area. I cannot guarantee stock as we only have 2-3 packs of some left. So, first come, first served! Questions asked and answers compiled by Joseph Sochor.